Access to sanitation facilities around the world, more than any other service, provides a window into the vast difference between the ‘haves’ and the ‘have-nots. “Those who do not have access to adequate sanitation are overwhelmingly people living in poverty, and marginalised and excluded individuals and groups,” she added. How can I participate in the virtual World Toilet Day campaign? The World Toilet Day campaign has been designed so that you can contribute and take action to advocate - no matter how much or little time you can dedicate. You can become part of a wider community of people who support this initiative through social media. We have provided a few examples of what you can do to create a buzz. Go on, it's free! What other World Toilet Day activities can I do? 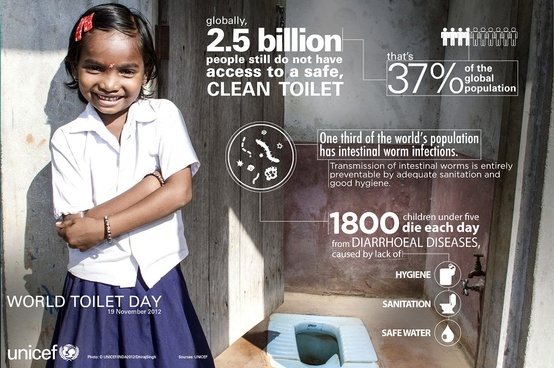 There are no limits to what you can do to raise awareness for sanitation and participate in the WTD campaign. Depending on your imagination and time, as well as your local cultural and political environment - a wide range of fun, exciting, engaging and solution-oriented events can be organized. We are providing you with some ideas that might trigger your imagination. Don't forget to share your plans on our interactive map! To help you with your campaign, check out and use our creative resources such as the poster, banner, sticker and new WTD logo! SHARE YOUR EVENT on our world map to show the world what you are planning. This will also make it easier for interested fellow campaigners to contact you and join your event.